This platform game was Kirby's debut and it was designed by Masahiro Sakurai who later created the Super Smash Bros. series. It contains five stages and your quest is to reclaim all the food from King Dedede. 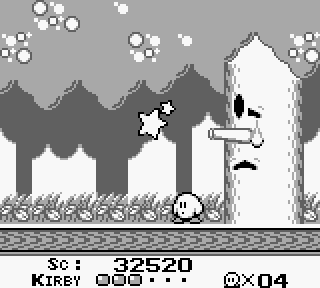 Kirby's unique ability is that he can inhale things and spit them out to destroy nearby enemies. He can also draw-in air and then float over gaps instead of having to resort to pixel-perfect jumps. What you won't see here is Kirby's famous gameplay mechanic where he swallows enemies and copies their abilities - this wasn't seen until the 1993 NES sequel called Kirby's Adventure. While Dream Land is an easy game it controls brilliantly and each world is full of character. The graphics look amazing on the small screen and the background detail is of a quality you'd expect on the NES. The level design is excellent as is the music with it's bright and breezy tunes. There's a nice range of enemies and certain ones can only be defeated by firing an enemy at them. The bosses aren't too tough but have been developed with lots of variety in mind. For example, in Stage 1 you need to hit the Tree with the falling apples by inhaling and throwing them back at its trunk. In Stage 3 you gain a temporary weapon which allows you to continually float and attack the boss with a never-ending supply of puffed air. The final stage has a boss-rush mode but considering the whole game can be beaten in 30 minutes it feels like a way to artificially lengthen the experience. The unlockable Extra Game is a tougher version of the game with new enemies and faster, more powerful bosses. It's quite a steep increase in difficulty but it's a good test for those who find the normal mode too easy. Kirby's Dream Land is a beautifully crafted game and everything about it just screams quality. There's no doubting that it's too short an adventure but HAL did a fantastic job in getting many of the core mechanics down for this debut and they created a solid platform title that still plays well today. Random trivia: Kirby's Adventure (the NES sequel) features some of the same mini-bosses and level designs from this game. It also includes a recreation of the Tree boss at the end of the first level!